A 1951 Buick air cleaner with a dirty element, or with oil that is dirty, too heavy, or too high in the sump, will restrict the air flow to the carburetor and cause a rich mixture at all speeds. The device will not properly remove dirt from the air and the dirt entering the engine will cause abnormal formation of carbon, sticking valves, and wear of piston rings and cylinder bores. 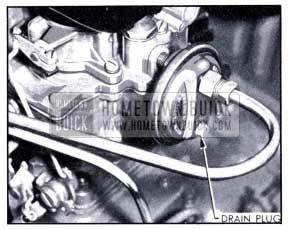 The bowl and strainer on the lower end of 1951 Buick fuel pump collects dirt and water which should be cleaned out periodically, at least twice a year. 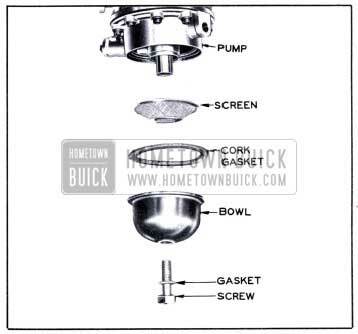 The 1951 Buick gasoline filter located at carburetor inlet collects dirt and water. The drain plug at the bottom of the inlet side of filter should be removed occasionally to drain out the accumulation of dirt and water. See figure 3-7. When a thorough cleaning is required, remove the filter, remove the drain plug and agitate the filter in Bendix Metaclene or its equivalent. Direct air stream through the outlet port of filter to force dirt from the inlet side of filtering disk. Rinse filter in kerosene, distillate, or white gasoline and again direct air stream through the outlet port. Install drain plug and reinstall filter. On 1951 Buick Carter carburetor it is necessary to remove the air horn in order to remove the strainer, which is located under a brass strainer nut in bowl cover. On Stromberg carburetor it is necessary to remove the carburetor in order to reach the strainer, which is held in the inlet port in air horn by a small wire retainer clip. 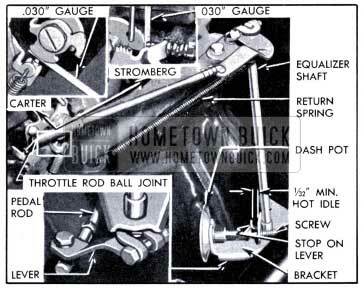 The 1951 Buick throttle linkage must work freely and be adjusted so that the accelerator pedal can move the throttle valve smoothly from fully closed to wide open positions. When pedal is pressed down against floor mat the throttle must fully open to the throttle stop on carburetor, and the choke unloader must be operated in the wide open position. When pedal is released, the throttle must close against the throttle stop screw; on Dynaflow cars the dash pot must govern the closing to prevent stalling or rolling of the engine. With engine hot and idling at 450 RPM, check clearance between the stop on lever at lower end of equalizer shaft and the shaft lower bracket. See figure 3-9. If clearance is less than 1/32” adjust throttle operating rod at ball joint to obtain a minimum of 1/32″ clearance. Tighten lock nut. With transmission in Direct Drive and brakes firmly applied, snap •throttle open to approximately 1400 RPM and immediately release accelerator pedal. If engine returns to idle too slowly, back out dash pot adjusting screw a little at a time until proper dash pot control is obtained. If engine returns to idle too fast causing engine to stall or roll, turn adjusting screw in. If proper control cannot be obtained by adjustment, replace dash pot. When the valve shaft is free, apply a mixture of kerosene and powdered graphite liberally to the shaft bearing; the mixture to be composed of 2% ounces of powdered graphite to 1 pint of kerosene. Lubrication of shaft every 1,000 miles is specified in Lubricare Instructions (par. 1-1). 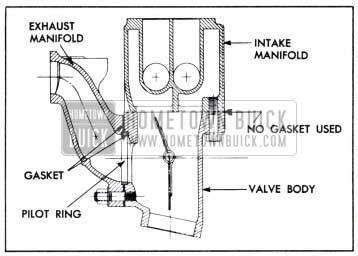 The setting of the 1951 Buick exhaust manifold valve thermostat may be checked when the engine is at room temperature of approximately 70°F. Unhook the outer end of thermostat from anchor stud on the valve body and hold the valve in the closed (heat on) position. To bring the end of thermostat to the anchor stud will then require approximately 1/4 turn wind-up of the thermostat. Bend clip “C” as required so that spring “A” will prevent the valve from contacting the valve body in either closed or open positions. Adjustment so that valve has sufficient clearance to prevent rattle in the closed position will usually be correct for the open position also. Clearance equal to 1/16″ to 1/8″ movement at the extreme end of counterweight is correct. Do not attempt to adjust the carburetor idle needle valves until it is known that the ignition system is in proper operating condition (par. 10-44), that compression is satisfactory and valves are properly adjusted. It should also be known that the exhaust manifold valve is operating properly (par. 3-9) and that intake manifold has no air leaks, that gasoline filters and strainers are clean (par. 3-7) that fuel pump is supplying carburetor with ample fuel at specified pressure (par. 3-15), that ‘the lair supply is not restricted by the air cleaner (par. 3-7) or choke (par. 3-11) and that throttle control linkage is correctly adjusted (par. 3-8). Any attempt to adjust or alter the carburetor to compensate for faulty conditions elsewhere in items affecting engine performance will result in reduced fuel economy an4 overall performance. 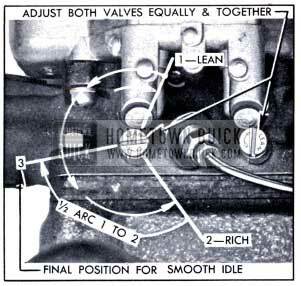 On Stromberg carburetor, turn each valve “OUT” (counterclockwise) 1 1/2 turns. 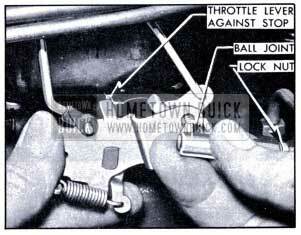 On Carter carburetor, turn each valve “OUT” 1 turn. Be careful to turn both valves exactly the same amount. Turn throttle stop screw “IN” (clockwise) until it just contacts arm on throttle lever (Carter) or lowest step of fast idle cam (Stromberg), then turn stop screw “IN” one complete turn. This setting will give an engine idling speed of approximately 450 RPM. NOTE: lf the engine operates on fast idle too long after starting or else moves to slow idle too soon, or the choke unloader does not operate properly, check fast idle cam and choke unloader adjustments as described in paragraph 3-21 (Carter) or paragraph 3-28 (Stromberg). Regardless of the methods or instruments used for making adjustments in the shop, the correctness of adjustment should be finally checked by a road test for smoothness at idling speed, power on acceleration, and freedom from sluggishness or fiat spots throughout entire speed range. Before removing the carburetor it is advisable to check the level of fuel in the float bowl to determine whether it is at correct height. Any deviation from the specified height will seriously affect carburetion. With engine idling at normal operating temperature, remove sight plug from float bowl and check height of fuel. On Carter and second type Stromberg carburetors, the fuel should be just high enough to wet the threads at lower side of sight hole. 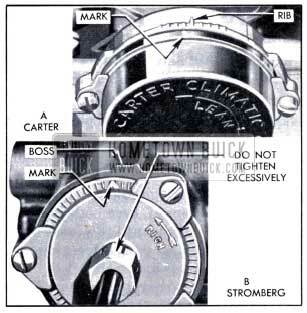 Second type Stromberg carburetors are distinguished from first type by having a larger sight hole boss, from which 1/16″ wide ribs extend horizontally on each side. On first type Stromberg carburetor the fuel level should be 1/32″ to 1/16″ below the lower side of sight hole. 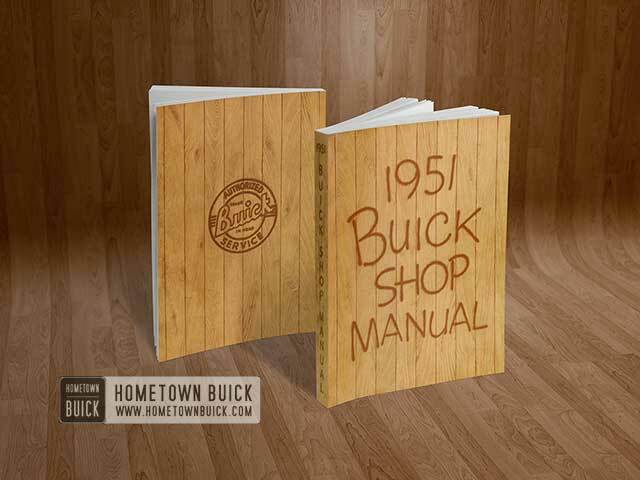 The 1951 Buick choke thermostat must be correctly adjusted in order to provide good performance during engine warm-up. The correctness of the thermostat setting can be tested only when the engine is cold. The carburetor must have been properly adjusted (par. 3-10) and the manifold heat control valve must be operating properly (par. 3-9). The cold engine should start readily, idle without loading or rolling, and should accelerate smoothly during the warm-up period while the choke is in operation. 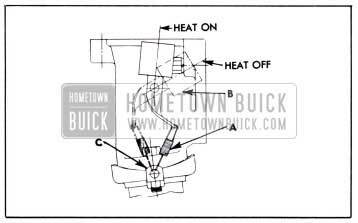 When 1951 Buick choke thermostat is cold and throttle is opened to release the fast idle cam, the thermostat should move choke valve to fully closed position. When working on 1951 Buick intake and exhaust manifolds it must be understood that both manifolds must be attached to the valve body and to the 1951 Buick cylinder head in such manner that slippage can take place at the joints to compensate for differences in rate of expansion and contraction of the several parts due to heat. This is necessary because the parts do not have the same temperature under all operating conditions. Install the valve body on the exhaust manifold with a new ring gasket in pilot ring recess in body and a new gasket between body and manifold; make sure that pilot ring is in place. See figure 3-13. Leave attaching stud nuts snug but not tight. Install intake and exhaust manifold assembly on engine with new intake manifold gaskets. The individual intake manifold gaskets are centered and the branches of the intake manifold are aligned with the intake ports in cylinder head by pilot rings installed at each joint. Exhaust manifold gaskets are not used. In production, a special compound is used at joints between manifold and cylinder head, and original manifold may be reinstalled without using additional compound. When a new manifold is installed, however, coat the joint surfaces with a thin fluid mixture of graphite and oil. 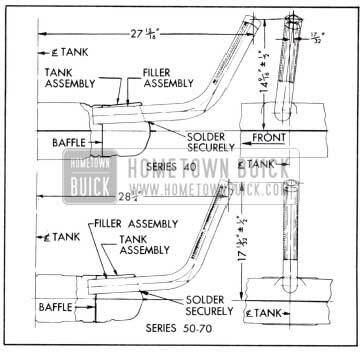 When removing 1951 Buick gasoline tank, disconnect feed pipe from gasoline gauge pipe, support the tank while disconnecting support straps at rear ends, then lower tank far enough to disconnect the wire from gasoline gauge.